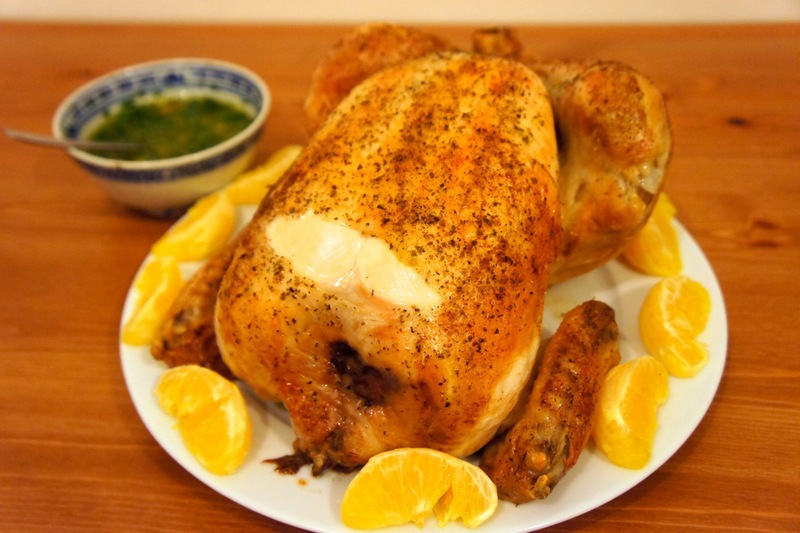 Our whole family loves roasted chicken and we also love fun words, so when I was researching our Dominican Republic weekend and I saw a recipe for pollo con wasakaka, or roasted chicken with garlic sauce, it was hard to go past. Unfortunately, garlic is high in FODMAPs, so I knew I was going to have to come up with an alternative. I’m a little ashamed to admit just how easy it was. The recipe is essentially this: roast a chicken. 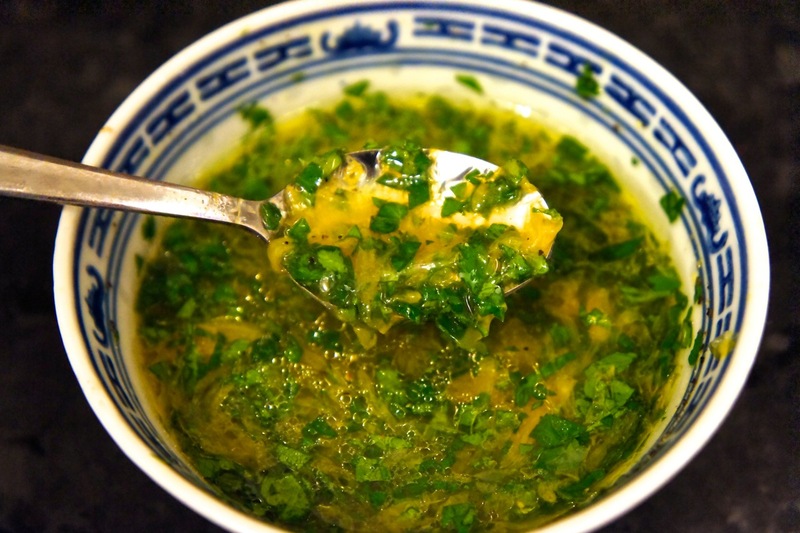 Serve with an easy sauce made of citrus juice, parsley, and garlic-infused olive oil. OK, need a few more details? Here goes. This was largely taken from Aunt Clara’s Kitchen, but I’ve roasted chicken so many times I didn’t really follow the recipe once I’d read it once. 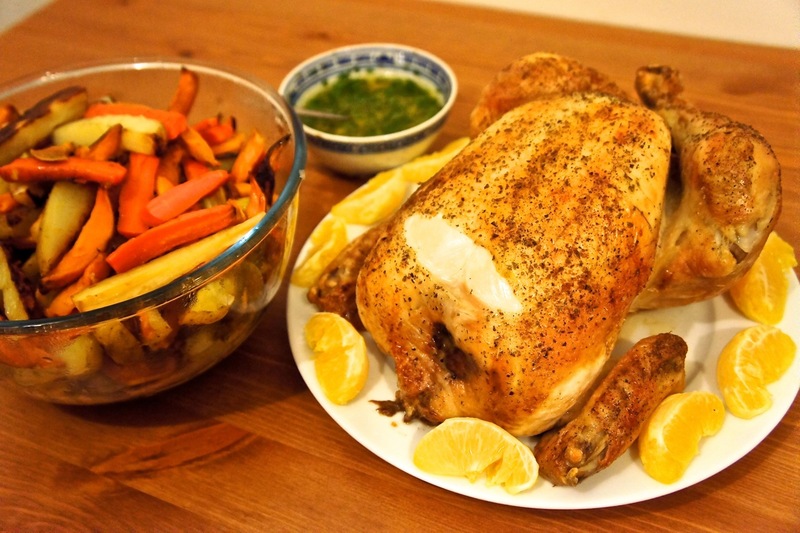 Roasted chicken is a great family food because the leftovers can stretch so far. Hot chicken sandwiches, chicken pot pie, chicken noodle soup, your own low-FODMAP chicken broth… there are so many possibilities. Now, if only I knew where the word “wasakaka” came from. I usually start by prepping the vegetables, as all the chopping and peeling can take awhile. Often I do this part a few hours in advance, while my little one naps. My kids believe all vegetables taste better if they look like fries/chips, so I cut the root vegetables into chip shapes. I don’t bother peeling the potato skin, though I do peel the sweet potato. I slice the zucchini into 1-cm or so slices, on the diagonal, and I cut the red pepper into strips about 2 cm wide. I toss the root vegetables in a bowl with a fairly generous drizzle of olive oil and a good sprinkling of salt and pepper. I toss the zucchini and red pepper in olive oil as well, separately, since they don’t need to cook as long. Then I put the root vegetables on a large baking sheet lined with non-stick baking paper, setting aside the zucchini and red pepper. Preheat oven to 325 F/170 C/150 C fan. Rub chicken all over with the half lime, squeezing out a bit of juice as you go but making sure not to squeeze all the juice out. Tuck what’s left of the half lime in the cavity. Pour a little olive oil on top and rub into the skin, then sprinkle skin with salt, pepper and oregano until skin is as evenly flecked as you can get. Put chicken in the oven but wait for 30 minutes before putting in the root vegetables. After root vegetables have been in the oven 30 minutes, take them out, flip them, mix them up and put them back in the oven. Put the red pepper and zucchini in the oven as well at this point. While you’re waiting for your chicken and vegetables to roast, make the wasakaka by juicing the orange and half lime, them mixing in a bowl with all the other ingredients. After a total of about 90 minutes, your chicken and vegetables should be done. To make sure your chicken is OK, put a meat thermometer into the thickest part of the thigh. You want it to read at least 85 C/180 F.
* You can buy garlic-infused olive oil commercially. This is all I’ve ever done, though I believe you can infuse olive oil with garlic yourself, then remove the garlic. Apparently FODMAPs from garlic do not dissolve in oil, though they do in water. So while making chicken broth with garlic, then picking out the garlic, will still result in a high-FODMAP broth, the same does not apply to garlic-infused olive oil. Thankfully. ** Half a cup of sweet potato is considered low-FODMAP. A normal-sized serving of mixed roasted vegetables like this should be OK, but watch yourself if you’re also having some of my sweet potato coconut muffins. This entry was posted in Latin American food, Mains, Meat, Sides, Vegetables and tagged chicken, citrus, Dominican Republic, gluten-free, low-FODMAP, main, meat, poultry, recipe, sauce, side, vegetables by karenyk. Bookmark the permalink.